Discover a hidden waterfall on this Hawaii hike. Join us on this moderate 2-mile round-trip guided waterfall hike. Experience the majestic beauty of our towering 200-foot waterfall, cross through tranquil streams, picturesque pools and lush tropical vegetation of Hawaii’s paradise. With average year-round temperatures of 80 degrees (cooler in the rainforest), refreshing trade winds and two volcanic mountain ranges on this Hawaiian island. As a locally owned and operated company with a passion for Oahu’s beauty, we take great pride in knowing our guests are sharing in something we have been doing since our childhood. 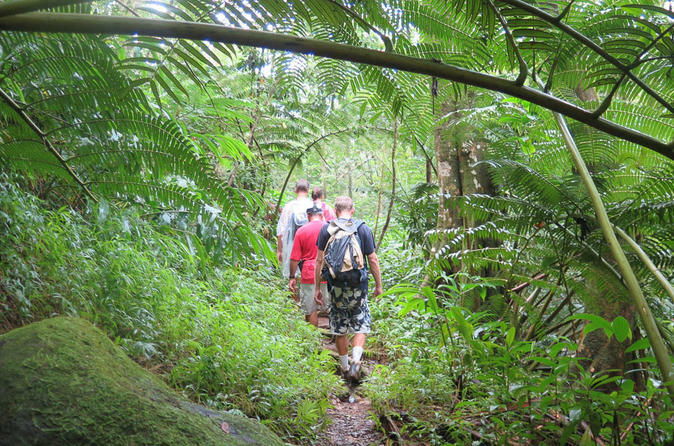 Our waterfall adventure is more than a hike; it is a trip through the past and present in the beautiful Manoa Valley rainforest. This is a mild to moderate hike over dirt trail with rocks and roots. In the rainforest, expect rain and forest. Trail can be muddy and slippery when wet. Hawaiian waterfalls will vary in water output depending on several factors, including recent rainfall. Hiking time is approximately 1.5 hours.